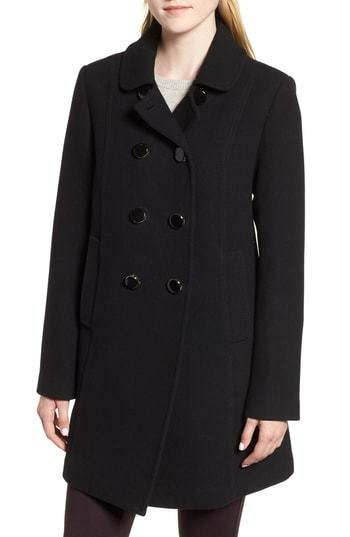 If you're looking for a casual yet stylish outfit, consider teaming a kate spade new york double breasted twill coat with black leather skinny jeans. Both items are totally comfy and will look fabulous paired together. Want to go easy on the shoe front? Throw in a pair of black suede low top sneakers for the day. If you're after a casual yet stylish ensemble, opt for a black coat and blue ripped skinny jeans. Both pieces are totally comfy and will look fabulous together. Sporting a pair of black leather oxford shoes is an easy way to add some flair to your outfit. For a killer-meets-totally stylish getup, make a black coat and black tapered pants your outfit choice — these items go really well together. Rock a pair of black slip-on sneakers to make the outfit current. If you're after a casual yet totally chic look, pair a kate spade new york double breasted twill coat from Nordstrom with blue flare jeans. Both garments are totally comfy and will look fabulous paired together. When it comes to footwear, this look pairs nicely with purple suede ankle boots. If you're searching for a casual yet totally chic ensemble, wear a kate spade new york double breasted twill coat from Nordstrom and olive skinny jeans. Both items are totally comfy and will look fabulous paired together. For a casual totally chic ensemble, rock a kate spade new york double breasted twill coat with a black pencil skirt — these two items play pretty good together. When it comes to footwear, this look pairs nicely with red leather pumps. If you're on the lookout for a casual yet stylish ensemble, choose a black coat and black leather skinny jeans. Both pieces are totally comfy and will look fabulous together. Make black embellished low top sneakers your footwear choice to loosen things up. For a smart casual ensemble, try pairing a kate spade new york double breasted twill coat with black leather skinny pants — these two items go really savvy together. Black studded leather mid-calf boots complement this getup very nicely. For a casually elegant getup, rock a kate spade new york double breasted twill coat from Nordstrom with a white pencil skirt — these two items the office pretty good together. When it comes to shoes, this look is complemented wonderfully with black suede mules.